Sponsorships- Silver sponsors included BMW of Bayside, North Shore LIJ Health System, and Shanghai Commer-cial Bank, Ltd. Bronze sponsors included Dr. Josephine Jung, Dr. Jackson Kuan, NY Hospital Queens, Dr. George Juang, OCA-Long Island, Summit Associates and Wonton Food, Inc. Other donations were made by Ms. Amy Cheng, Mr. Jerry Hsieh, Oogie Art, Inc., Dr. Samual Jung, Ms. Joy Chiang of Excel Academy, Mrs. Betty Lin, and Mrs. Jenny Tsoumpas. 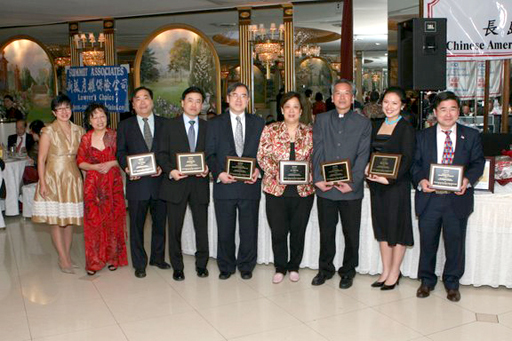 The Chinese Association of North Hempstead (CAANH) held their 14th annual gala at the Crest Hollow Country Club on the evening of March 12, 2011, where 220 guests enjoyed a wonderful evening. Attendees socialized over cocktails and drinks followed by dinner and dancing. 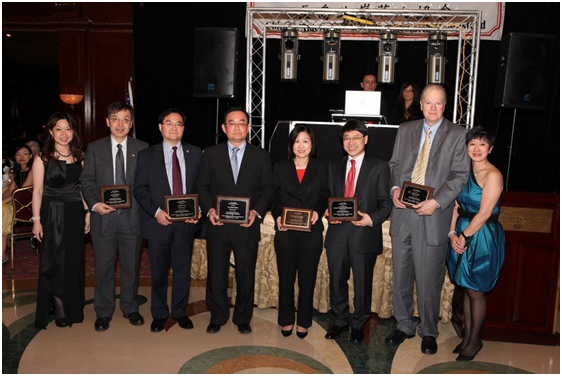 Mr. Gene Woo (OCA-LI), Dr. James Cui, Dr. Jackson Kuan, Ms. Jenny Kwong, Dr. George Juang, and Mr. Gregory Gardellis (Summit Associates), pictured with the Co-Presidents Gloria Juang and Lana Choy. Sponsors not pictured include: Shanghai Commercial Bank Ltd, Wonton Food Inc., SPK Lewis Construction, and St. Jude Medical). We are also grateful to our other sponsors: OOGIE Art Inc., Dr. Stephen Wan, Emily Facial, SCC Learning Company, Premier Aptitude, and Mr. Lee Tu. 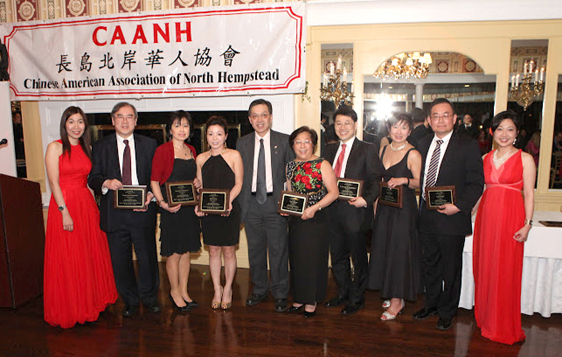 The Chinese Association of North Hempstead (CAANH) held their 13th annual gala at the Crest Hollow Country Club on the evening of March 13, 2010, where 250 guests enjoyed a wonderful evening. Attendees socialized over cocktails and drinks followed by dinner and dancing. Alice Chan & Lana Choy, co-presidents of CAANH with all the Silver Sponsors. 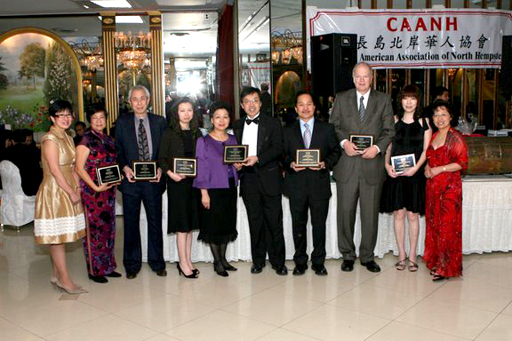 CAANH held their 12th annual gala at Leonard’s in Great Neck on March 21, 2009 and had in attendance over 200 guests. Attendees enjoyed a wonderful evening beginning with cocktails and drinks followed by dinner and dancing to music provided by a popular DJ. CAANH held its traditional Gala event at Leonard’s on March 15, 2008. Over 200 guests arrived to celebrate the occasion including Representative Mei Wah, Councilman John Liu, Councilman Angelo Ferrara, as well as Legislator Wayne Wink. Copyright © 2006 CHINESE AMERICAN ASSOCIATION OF NORTH HEMPSTEAD. All rights reserved. Powered by Shine Line Inc.